WITH THE RELEASE OF SKETCHUP 2019, CONDOC TOOLS BRINGS A FULLY INTEGRATED UPDATE… PACKED WITH ADDITIONAL FEATURES AND FUNCTIONALITY. These ensure your geometry gets placed on the right layer, every time. Super cool! Now you can isolate your levels with one click. Our 3D warehouse page has an updated garage model you can use for reference. More ways for you to stay organized, and create customized drawing sets in half the time! We've expanded library to give you even more customization for your drawings. Snazzy! Experience a whole new way to make drawing. Drag and drop to build your designs in LayOut. Who knew? We leverage the new SketchUp 2019 vector dashed lines. Crisp and clean! Create beautiful drawings with our updated annotations and scrapbooks, plus a totally new 2D to 3D workflow. SketchUp now has dashed line types, which means we can swap out the old raster style, for crisp vector dashes. Look in the 2019 drawing sets for the updated demolition plans, foundation plan, roof plan, and elevations. These drawings have all been updated to utilize the new dashed line feature. Take advantage of 10+ years of proven best practices as well as the essential tools and workflow that have been perfectly integrated with SketchUp Pro. This is the leading extension for SketchUp users interested in taking their drawings to the next level. When kicking off a new project, it can be easier to solve your space plan in 2D with markers and trace. However, it can be a big jump to go from an informal 2D drawing to a precise 3D model. LayOut’s Scaled Drawing feature bridges this gap, by allowing users to convert sketches into accurately scaled architectural drawings. ConDoc accelerates this workflow with the new annotations Scrapbook, which includes 2D blocks for scaled walls, doors, windows, furniture, and fixtures. Just drop the pieces into place to create your design. 2D Drafting has never been easier! Once your design is ready for further exploration and refinement in 3D, use the brand new CAD export settings in LayOut to send your 2D drawings to SketchUp. The workflow is Seamless! Tip: If you are new to ConDoc, use this workflow to push drawings out fast while you learn the full 3D system. Organizing your model by LEVEL, ELEMENT, LOCATION, and CONDITION can be difficult to learn. Even once you fully understand the approach, it’s time consuming to manually make all those groups and assign layers. The new model organization guides make this process instant, painless, and the results perfect. Just drop the model organization guide into your project, click into the appropriate container, and start modeling. 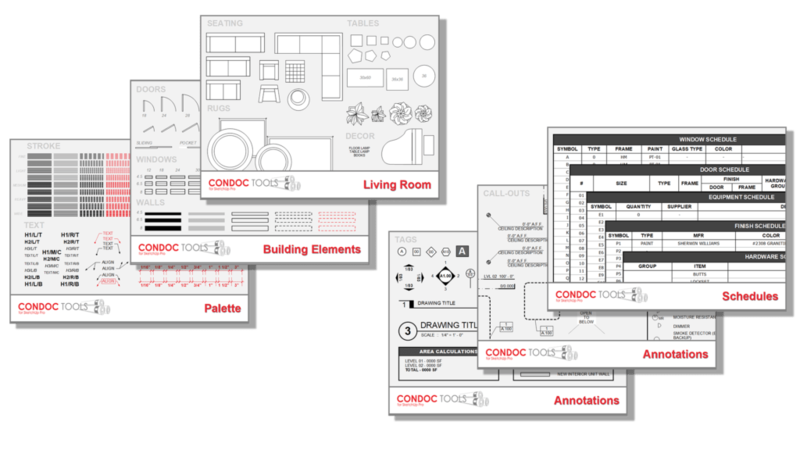 The ConDoc Model Organization guides are perfect for users of all skill levels. If you are a beginner, these make nesting and layering crystal clear… and if you are a seasoned pro, you are going to save a ton of time by eliminating grouping and layering from your process. If you aren’t using the layer state buttons you are missing out! You already have LOCATION and CONDITION layer toggles to isolate specific parts of your design with one click. In this new ConDoc release we added a LEVEL layer toggle. You can now isolate each floor of your design with one click, and save even more time by staying out of the Layers dialog! Tip: All of the ConDoc System buttons can also have keyboard shortcuts assigned to them. ConDoc 4.5 will ship with a completely reinvented annotations scrapbook. There will be tons of new and improved palettes, symbols, and schedules.